Shooting Gallery by Hailey Lind, a Mysterious Review. Review: Annie Kincaid continues to balance personal and professional relationships, faux finishing and art forgeries, and murder and mayhem in Shooting Gallery, the second mystery in this engaging series by Hailey Lind. Annie's mother, Beverly, plays a pivotal role in Shooting Gallery. Though there is no obvious connection to a dead sculptor or to a painting stolen from the Brock Museum, Beverly's unannounced trip to San Francisco and subsequent actions are a mystery to Annie. Though relatively minor, this subplot is often more affecting than the more conspicuous mysteries in the book. Lind keeps the pace of Shooting Gallery brisk, though at times glosses over plot points that could use a bit more explanation. The minor detail of how the corpse of Seamus McGraw comes to be hanging in the gallery's garden, for example, remains unclear. There are light comedic episodes scattered throughout, but the final act incongruously degenerates into slapstick, saved only by the touching revelations by Annie's mother. Lind maintains the practice, first used in Feint of Art, of prefacing each chapter with delightful quotes from Grandpapa Georges. An example of these insightful, provocative, and often very amusing comments: "Salvador Dali is said to have signed tens of thousands of blank pieces of paper for lithographs he had never seen, much less created. For this brilliant attempt to evade poverty he has been dubbed a forger of his own work." 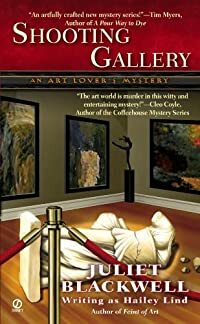 While fans of art-themed mysteries will definitely enjoy Shooting Gallery, with its insider references to great art, artists, and "restorers", the book should also appeal to anyone who enjoys an entertaining story. Acknowledgment: Hailey Lind provided an ARC of Shooting Gallery for this review.